In Standard Arabic, on the other hand, as any Algerian learns in primary school, it's a qalam قَلَمٌ. This, as it happens, may also be a borrowing, though a much older one; compare ancient Greek kálamos κάλαμος "reed, reed-pen", which apparently has an Indo-European etymology. Clearly, either pre-modern Algerians were so sunk in illiteracy as to have forgotten the word for a pen altogether, or they replaced a pre-existing word for pen with a French borrowing - right? Any Algerian who went to Qur'anic school up to the 1960s or so will remember this - a simple reed pen anyone can make using nothing more complicated than a sharp knife. (The Algerian version was a bit different than those in the picture, as it happens - usually people would use a quarter-circumference of a large reed, not the whole circumference of a small one.) More than that, they will remember what it's called: qləm قلم. There are probably people in Algeria who still use these, and very likely they still call them that. But no one calls a modern industrial pen qləm. When industrial pens were introduced, sometime in the 19th century, ordinary Algerians ended up classing them as a new object, quite distinct from the reed pen despite its similar function, and deserving of an unrelated name. The guardians of Standard Arabic, on the other hand, decided to extend the reference of qalam to cover both. It may be no coincidence that French distinguishes calame from stylo, like Algerian Arabic, whereas English, like Standard Arabic, treats both as diferent types of pen. Historical linguists regularly use lexical reconstruction to shed light on technological history, an approach called "Wörter und Sachen". This approach has been very fruitful in many cases. But, as this case illustrates, there are some pitfalls to watch out for: whether something counts as the same object or as a new one is a rather culture-bound question, and if investigators impose their own ideas about this on the situation they are investigating, they will get the wrong answer. 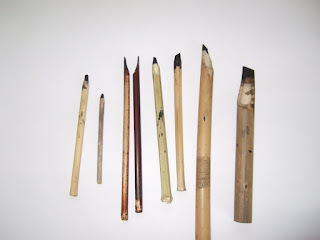 Nowadays, qləm means a "pencil". A pen, of course, is a feather (Latin penna); as usual, English borrows, German calques, so that a fountain pen is Füllfeder in German – a feather you fill ink into. The IE etymology of kálamos appears impeccable to me; the only part that's not impeccable is the shape of the PIE reconstruction, which is taken straight from Pokorny and was arguably already outdated in the 1950s. If you click on "Nostratic etymology", you'll suddenly find the PIE stem reconstructed as *k'oləm- instead of *k'alam-, and indeed, from looking at the reflexes, I figured it had to be *kʲolh₂m- before I clicked on "Nostratic etymology". (A "laryngeal" is needed to explain the "acute" phonation of the Balto-Slavic reflexes and to explain why the Greek form has an extra vowel; *h₂ is needed to explain why that vowel is specifically a. The fact that the first vowel is also a may indicate that the Greek form is zero-grade rather than o-grade, with al as the regular reflex of PIE syllabic *l.) BTW, German has a reflex, Halm, meaning a stalk of grass/reed/cereal. Yup, same for Dutch too, although often in a compound strohalm 'hay-stalk'. Jeffery derived qalam indirectly from Greek, mediated by Geez ḳäläm. He also points out that there's evidence in the Quran that not only the meaning "pen" was present, but in this case "lots" in the casting of lots. (despite being translated as such in this link: https://quran.com/3/44/). Incidentally in Dutch you have the practice of 'strootje trekken' (pulling a little straw). Where one person places a collection of short straw stalks in their hand, and whoever pulls the shortest one gets to do the thing nobody wants to do. OK, I guess the IE etymology looks correct then - I was a bit suspicious because of the similarity to Semitic roots for "cane". Strohhalm "a straw", Stroh "straw". The final silent -h is phonetically redundant and apparently not etymological either; that happens. What are these Semitic roots for "cane", actually? No Afro-Asiatic at all is listed under "Nostratic etymology", so I'm curious. qləm seems to be a modern borrowing of Arabic qalam raSaas. I am not an Algerian though, I am from central Tunisia. My brother-in-law's boss (senior customs officer) uses 'qələm' or 'kələm' as an umbrella term for any writing instrument, but in the context of making himself understood to all kinds of Arabic-speakers. His everyday word for 'pencil' is 'kreyon'. A ball-point or feutre pen is for him a 'stilu', but he has some fancy word I've not yet managed to note down for 'fountain-pen' (remember those?). David, the farthest back we can trace 'cane' with certainty is to Greek 'kanna'. The similarity to Hebrew 'qaneh' and its cognates in other Semitic languages is suggestive of an original Semitic source, but I'm not persuaded enough to put money on it. How do you -- or Algerians in general -- feel about the french language? Is it rising in usage or is it declining? Do you feel like French as a lingua franca in Africa (especially in subsaharian Africa, in countries such as Benin, Cote d'Ivoire, Cameroon and Congo) has any influence in the way Algerian people feel about French?